We care passionately about keeping our oceans and our environment clean, and above all, safe for habitat. Sanford responds to existing and emerging environmental issues by seeking to improve performance standards in all our operations, and through active participation in industry environmental initiatives and forums. 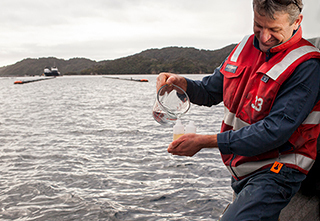 Sanford is the only major seafood company to have maintained ISO 14001 environmental certification across its New Zealand operations for the last 14 years. We are also the only major seafood company to have publically produced an Integrated Annual Report that integrates environmental, social and economic performance using the Integrated Reporting (IR) framework and Global Reporting Initiative (GRI-G4) global indicators. The impacts of climate change have the potential to dramatically affect our industry, particularly in relation to marine species and the changes resulting from ocean acidification. In order to be the best seafood company in the world, we need to recognise that our operations have an impact and put in place initiatives to manage and reduce these over time. In order to ensure accuracy and consistency, our Greenhouse Gas (GHG) information is collated through a standardised reporting tool, used across the business. Ocean water becomes more acidic when it absorbs carbon dioxide. This creates a risk to the marine environment and the sustainability of our business. Although we are geographically isolated and yet to see the full impact of ocean acidification, good baseline data and ongoing monitoring programmes are highly important to us. We participate in international programmes to collect data and find solutions to this challenge. A large part of the improvement in our waste management has been some innovative ideas around diverting blue mussel and organic marine waste from landfill. One such significant project is seeing 90 to 95 percent of waste material produced by the Havelock factory diverted to Yealands Estate Wines in Marlborough. Fleet Management monitors the effectiveness and efficiency of our vessels. Within our deepwater operations MoTeC, a data acquisition system, is installed on vessels to gather data on the amount of fuel used when steaming in various weather and fishing conditions. Our goal is to identify the optimal speed for the vessels concerned. MoTeC is also becoming a fundamental tool for engineers to assist with managing and maintaining each vessel. Our inshore vessels are also being re-evaluated to ensure optimum operational and fuel efficiencies are achieved. By allowing the engineers to analyse systems while at sea, fuel efficiency can be improved and future engine failures can be reduced through the ability to investigate past malfunctions. We have successfully introduced Dyneema™ net material onto two of our deepwater vessels, San Discovery and San Enterprise, and one of our scampi vessels, Albatross. Dyneema™ is a high-performance polyethylene fibre known to be the world’s strongest fibre. It is resistant to abrasion, most chemicals and salt, but light enough to float on water. Being lightweight and having a very low resistance, it creates significantly less drag, improving fuel eco-efficiency. Other benefits include higher catch performance on the same amount of fuel and lower maintenance costs due the high durability of Dyneema™ fibre, as well as a reduction in the wear and tear of other equipment, such as winches and warps. We are constantly looking at energy efficiencies from our fishing equipment, the use of hydro dynamically designed foiled trawl doors and other examples. We encourage staff to come forward with ideas, to innovate, and give things a go. The ‘Fish & Chip Tractor’ was a challenge initiated by the Sanford Havelock engineering team to come up with a way of running a tractor off discarded chip-oil. Although this was more of a fun project than a major initiative, it’s all about getting our people thinking innovatively and creatively about how we can be more energy efficient. We’ve achieved an 11% reduction in emission eco-efficiency from 2014 to 2015. Refrigeration units are our biggest consumers of energy. We worked with EECA in 2014 to investigate how we could reduce our impact in this area, and undertook assessments at our Auckland and Tauranga sites. The audit identified savings that could be made in Tauranga, including LED lighting within the coldstore and wet room, and a roller door on the coldstore. These changes will bring expected energy savings of approximately 390,000 kWh. Work will continue with EECA in 2016 through a potential partnership with Deta Consulting. This will support our continued efforts to reduce electricity consumption and introduce emission reduction targets. Water is an important resource that is used in all of our operations. We continually ensure that it is being used as efficiently as possible, whether for making ice or cleaning, cooling compressors or cooling opened mussels. Coal is the most cost-efficient fuel source to run our Timaru fishmeal plant boiler; the only consumer of coal in our operation.